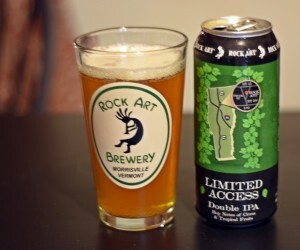 Rock Art decided to have a little fun naming their new DIPA. If you have visited Rock Art or Lost Nation in the past several months you know there has been a significant road construction project near their facility. The project is complete and instead of driving right by Rock Art, Route 100 now brings you behind their building. If you are not paying attention you can easily drive right past. This is why they decided to call this beer Limited Access and put a map to the brewery on it. Limited Access is another great Vermont double IPA in a 16 ounce can that might be overlooked by those seeking Heady or Sip of Sunshine. Slightly hazy orange in color with a really nice mix of pine, grapefruit, pineapple and other tropical fruits. Taste follows with just enough of a malt presence to let the hops shine through. Very easy to drink for a DIPA with a nice amount of carbonation and reasonable bitterness. Do not overlook this beer. This is another beer from Paul given to me on my 40th birthday. Gilgamesh is an entirely new brewery for me, had not even heard of them before getting this beer but apparently someone at the brewery must like the show Fresh Prince of Bel Air as they have a couple beers with names relating to the show; this one, DJ Jazzy Hef and then a few others with movie references. Always interesting to see how breweries come up with the names for their beer. Generally I am not impressed with wet hopped beers. It seems like a great idea, pick some hops from the bine, toss them into a beer and enjoy. Unfortunately the end result is not as hoppy as you would expect. 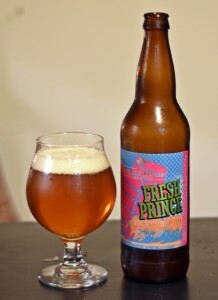 Fresh Prince is described as a triple wet hopped double IPA so my expectations were high. Great looking beer with a clear deep orange and off white head. Aroma was caramel malts and a bit of pine, overall pretty underwhelming for a double IPA. Taste moved away from the pine with a lot of flower and lemon zest. Finish had a fair amount of alcohol considering it is only 7.8% ABV. Overall this is one of the better fresh hopped IPAs I have tried but still not a beer I would seek out again. Brewers Description: A double IPA brewed with copious amountss of Centennial hops fresh off the vines. 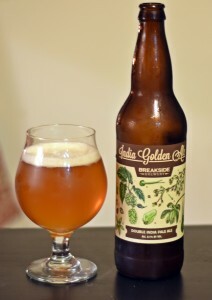 This triple wet-hopped ale has a golden color, short-lived bitterness, and an astounding aroma. My brother in law often attends events with me and gets a lot of great beer from my frequent trips to breweries. Occasionally he repays me with beer including this one from Tree House. 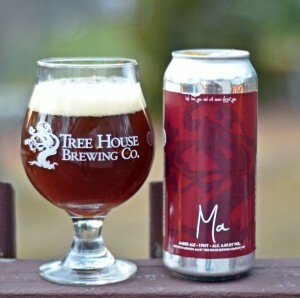 Ma is a hoppy red ale and like many beers from Tree House now comes in 16 ounce cans with a label stuck to it. 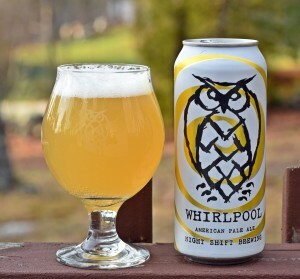 Love that they are canning their beer now and still need to find a reason to make more regular trips to Monson. Ma pours a deep red almost brown with a thick off white head, really nice looking beer. Aroma is an interesting mix of piney hops, slightly fruity and sweet almost bubble gum. Taste starts with the sweet malts you would expect from a red but the hops really shine in the end with plenty pine and citrus. Slightly bitter finish with nice amount of carbonation. Really well done beer and as much as I don’t like the black IPA I am really enjoying these hoppy red ales. Ma is right there with Nugget Nectar and Stoneface’s Red Rye IPA as a few of my favorite hoppy red ales. 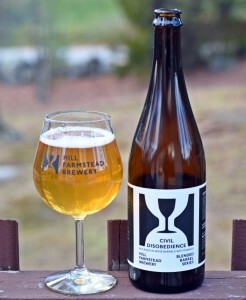 This is actually my first review of a beer from Hill Farmstead’s Civil Disobedience series even though I have tried several and have many more in the cellar. 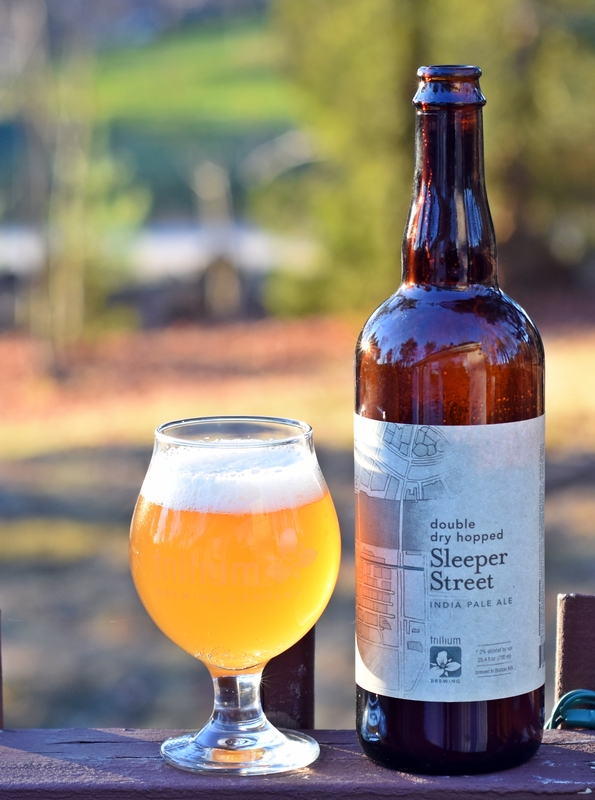 The Civil Disobedience beers are typically a blend of various barrel aged beers and have included some of the more rare offerings from Hill including Art, Ann, Mimosa and Juicy. CD15 is a blend of barrels that was then aged on “mangos… many, many mangos”. CD15 pours a very clear pale orange with thin white head that disappeared quickly leaving a small ring and minimal lacing. Aroma was slightly funky with some mango, citrus and wine. Taste was juicy mango, very little brett funk and not a lot of wine barrel but just enough to be noticeable. Overall this is an excellent beer that has enough complexity to make it interesting but isn’t overwhelming. Brewers Description: A blend composed of beers from a diversity of barrels ranging from 16 to 30 months and further aged on organic, hand peeled mangos… many, many mangos, thanks to the able assistance of some great volunteers! Received this bottle as a gift at my 40th birthday party from Paul who travels to Oregon regularly as he works with Willamette Valley Hops. Breakside is located in Portland, Oregon and I believe this is the first beer I have tried from them. India Golden Ale is a double IPA brewed with Eldorado. Mosaic and Chinook hops which makes for an interesting mix of aromas and flavor. Pour is a hazy deep copper color. Aroma has a solid amount of tropical fruit and is slightly sweet. The tropical fruits are all but gone from the taste which was a bit of a disappointment. They are replaced by a strong floral, piney flavor which was OK but not what I hoped for after the excellent aroma. Bitter on the frond end and the alcohol is well masked considering its 8.1% ABV. I have no idea how old this bottle was when I got around to drinking it so it may have changed a bit from when it was brewed. If you find yourself in Oregon and see this on tap give a try as I don’t think you will be disappointed. Brewers Description: Originally crafted with Ninkasi Brewing, this double IPA is the lightest, hoppiest beer you’ll ever try. Loaded with tropical and fruity notes from Mosaic, Eldorado and Chinook. I enjoy a good saison and Trillium’s saison, also called Trillium, is a very good straight up saison. On one of my recent trips to Boston they had this Citra Dry Hopped version of Sunshower which is classified as a super saison due to its higher than normal 8.5% ABV. The only other “super” saison review that I can think of is Lively Brewing’s Magic Mike which came in at a whopping 11% ABV. Sunshower pours a nice clear orange with a very thick white head, much cleaner than other beers I have reviewed from Trillium. Aroma is an interesting mix of citrus and lemon, spice and earthy notes from the saison yeast. Taste leans more toward the saison side with some pepper, earthy, floral notes – the Citra hops seem to be lost for the most part. The alcohol was more apparent as the beer warmed a bit but that is to be expected for an 8.5% ABV beer. Overall a solid beer but with so many exceptional beers being brewed at Trillium it is unlikely I will buy this one again. 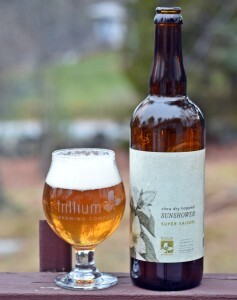 Brewers Description: Sunshower is our Super Saison, a high-gravity farmhouse ale inspired by the ethereal refreshing mid-summer moments when we experience both rainfall and the heat of the sun in New England. Similar to our flagship Trillium, the mouthfeel is light and effervescent with a bright, golden hue. We allow the fermentation temperature to free-rise that favors the saison yeast strain’s in the blend to realize its full attenuation potential which results in a dry beer with strength and complexity. Layers of pepper and earthy characteristics that play nice with the crisp, smooth backbone of a pilsner and wheat malt bill.